Suitable for small stores,supermarket,hyper market,Distribute stores. 5)Surface treatment: Zinc with clear powder coating lacquer,Chrome plated with clear lacquer, E-coating grey or other powder coating. 8)Plastic parts color : Red,blue,Any color according to pantone code. 9) Caster: Travelator casters,normal flat caster,PVC,PU,TPE materials etc. 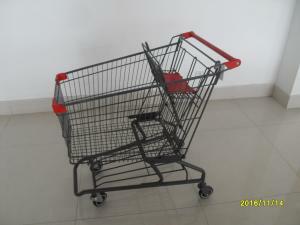 Kailiou Commercial Equipment Co,.Ltd is a professional manufacturer for shopping trolleys. With a production area of 25,000 square meters, we have some "Panasonic" automatic welding robots, advanced CNC pipes and steel bending machines, more than 20 sets high-tech automatic welding machines and a automatic powder coating line. Also we have a laboratory for testing our shopping trolleys. It includes a "high and low temperature" testing equipment, eroding testing equipment, ultraviolet radiation testing equipment, and a “load & wear-proof" equipment for casters etc. Currently, our annual production of shopping trolley reaches 500,000 units, and more than 95% of our products are exported to around 50 countries. As a famous &valuable brand, Kailiou was honored as "Famous Brand of Suzhou". Our products have passed SGS-ISO: 9001-2000 Quality System, GS , CE and ROHS certification. Our management concept is struggling for quality products, developing through faith and strong strength. All customers are very satisfied with our products, thanks for trusting and choosing us! We sincerely welcome you to visit our company, and look forward to the opportunities of cooperating with you.